Apostolic Titbits: Do What You Can, Then God Will Do What You Can't! Do What You Can, Then God Will Do What You Can't! A man was sleeping at night in his cabin when suddenly his room filled with light, and God appeared. The Lord told the man he had work for him to do, and showed him a large rock in front of his cabin. The Lord explained that the man was to push against the rock with all his might. So, this the man did, day after day. 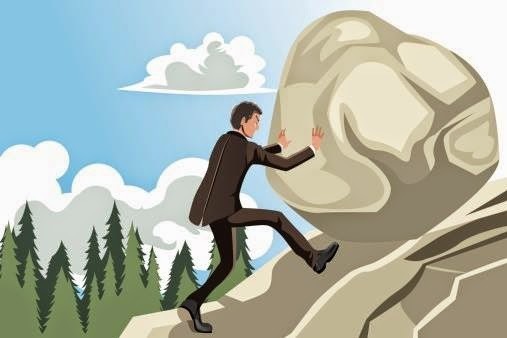 Since the man was showing discouragement, the Adversary (Satan) decided to enter the picture by placing thoughts into the weary mind: "You have been pushing against that rock for a long time, and it hasn't moved." Thus, he gave the man the impression that the task was impossible and that he was a failure. These thoughts discouraged and disheartened the man. Satan said, "Why kill yourself over this? Just put in your time, giving just the minimum effort; and that will be good enough." That's what the weary man planned to do, but decided to make it a matter of prayer and to take his troubled thoughts to the Lord. "Lord," he said, "I have labored long and hard in your service, putting all my strength to do that which you have asked. Yet, after all this time, I have not even budged that rock by half a millimeter. What is wrong? Why am I failing?" The Lord responded compassionately, "My friend, when I asked you to serve Me and you accepted, I told you that your task was to push against the rock with all of your strength, which you have done. Never once did I mention to you that I expected you to move it. Your task was to push. And now you come to Me with your strength spent, thinking that you have failed. But, is that really so? Look at yourself. Your arms are strong and muscled, your back sinewy and brown; your hands are callused from constant pressure, your legs have become massive and hard. Through opposition you have grown much, and your abilities now surpass that which you used to have. True, you haven't moved the rock. But your calling was to be obedient and to push and to exercise your faith and trust in My wisdom. That you have done. Now I, my friend, will move the rock." At times, when we hear a word from God, we tend to use our own intellect to decipher what He wants, when actually what God wants is just a simple obedience and faith in Him. By all means, exercise the faith that moves mountains, but know that it is still God who moves mountains. When everything seems to go wrong . just P.U.S.H.! When people don't react the way you think they should ... just P.U.S.H! When your money is "gone" and the bills are due....just P.U.S.H! When people just don't understand you, just P.U.S.H.